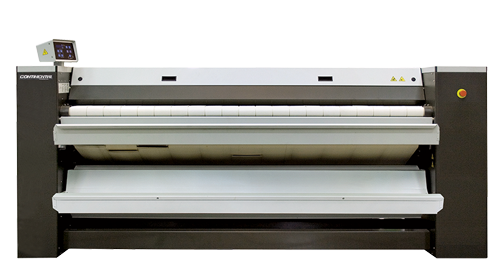 Express Heated-Roll Ironers are engineered for years of trouble-free use and maintenance. Nicely suited for most on-premise laundries and commercial applications, these ironers are available in multiple finishing widths and 13- or 20-inch diameter rolls. 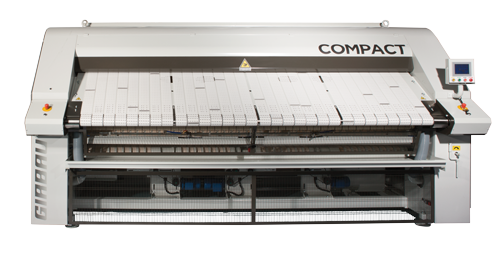 Express Heated-Roll Ironers offer no-wax finishing for significantly simplified maintenance. Engineered for medium- and high-volume laundries where space is at a premium, the Compact 5-in-One Ironing System not only features a compact design, it quickly feeds, irons, folds, stacks and accumulates at speeds of up to 50-feet-per-minute.